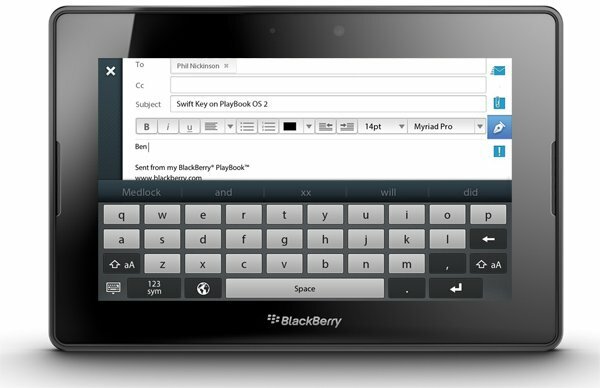 When BlackBerry PlayBook OS 2.0 was we released were a little surprised to find out that it was indeed making use of SwiftKey for it's new auto-correct functionality. The latest announcement from SwiftKey sheds light on the subject though, as they've now announced a new SDK for handset and device manufacturers. The SwiftKey SDK is being made available to various platforms including iOS, QNX/BlackBerry 10, Windows and more. You can find the full press release from SwiftKey past the break for you all. Barcelona, Spain -- February 27, 2012 – SwiftKey™ (http://www.swiftkey.net), the company behind the award-winning SwiftKey X keyboard for Android™ smartphones, is making the core language-engine technology that powers its app available to OEMs. The move will allow handset and device manufacturers to embed SwiftKey’s smart language technology into their own devices through a Software Development Kit (SDK). SwiftKey X has already proven immensely popular as a stand-alone app. It has been downloaded more than five million times, making it one of the most popular paid for applications on the planet in its category. In addition, SwiftKey’s technology has been shortlisted for the Most Innovative App in this year’s GSMA Global Mobile Awards at Mobile World Congress. The SDK enables tablet and handset manufacturers to offer cutting edge prediction and correction technology in their products, powered by SwiftKey’s Natural Language Processing language engine. OEMs can build SwiftKey’s core technology into their own keyboard and UI, to improve the core user experience of their devices. The SDK introduces a range of new features in addition to those currently available on SwiftKey X, with support for over 40 languages, including Arabic, Korean and Spanish. SwiftKey makes typing much easier on Android smartphones, replacing the touchscreen keyboard with one powered by smarter natural language technology. The app, which launched in beta in July 2010, understands how words work together to give much more accurate corrections and predictions than other keyboards. It also powerfully learns over time to make typing easier and even more accurate, and users can personalize it using Gmail, Facebook, Twitter, SMS or their blog posts. To date SwiftKey has received more than five million downloads, saving users more than 30 billion keystrokes: equivalent to over 350 years spent typing. TouchType Ltd, the company behind SwiftKey, was founded in August 2008 by Jon Reynolds, CEO, and Dr Ben Medlock, CTO, both Cambridge University graduates. With a growing team of over 30 people, the company is based in Southwark, London, UK.